elobeatlesforever: LEGO Idea: ELO Spaceship Needs Your Support For Launch! LEGO Idea: ELO Spaceship Needs Your Support For Launch! Great rock bands have great spaceships, and the Electric Light Orchestra, or "ELO", had one of the greatest. In 1970, Jeff Lynne and friends formed the Electric Light Orchestra and fast became one of the most successful rock/pop acts of the 70's and 80's, with millions of records sold worldwide. The band's icon was originally based on a jukebox speaker design, but ELO's interest in futuristic sounds and imagery soon turned the iconic red and yellow disc into a spaceship or space station which adorned the cover of many of their best-selling albums. This LEGO version is a hand-held, "swooshable" version of that ship, complete with a cockpit that seats Jeff Lynne and his guitar! Thrusters on the bottom enable successful landings and takeoffs from any interplanetary surface! The Jeff Lynne mini figure sports his iconic large round sunglasses and shaggy mane. "Shine a Little Love", make some "Strange Magic", and fly this ship across "Mr. Blue Sky"! 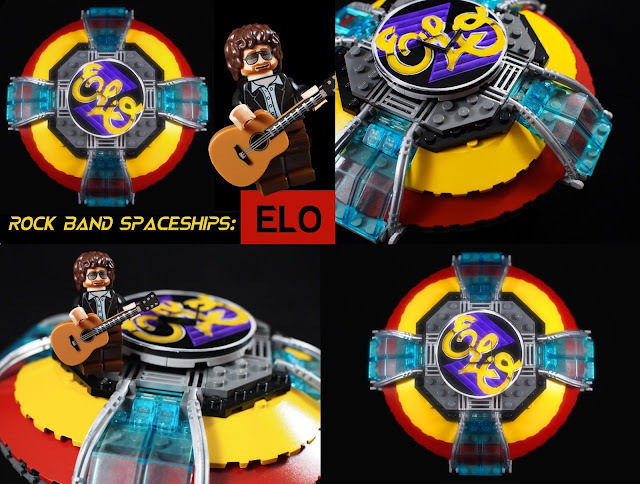 elobeatlesforever (elobf) recommends LEGO Idea: ELO Spaceship to those enlightened folks who enjoy the music of ELO, Jeff Lynne, The Traveling Wilburys, Roy Wood, The Move, The Idle Race, 'Brum Beat', The Beatles and related artistes. How awesome would that be? Hope they make it. A whole rock band series of Lego sets would be cool too, RUSH being next in line, then more to follow.